Hooping is widely recognized by health and fitness experts as being a superb form of exercise.Hooping increases muscle tone and strength; it also improves cardiovascular health and burns calories, since it is a type of aerobic exercise. A study by the American Council on Exercise found that a thirty-minute hooping workout burns around 200 calories. Hooping works many muscles in the body and has the potential to build core muscle strength while improving flexibility and balance. Hula hooping requires effort from some of the biggest muscles in the body. These muscles require a significant amount of energy, so it forces the body to burn fat stores. Hula hooping works out several of your body’s core muscles. It strengthens and tones these muscles. Muscles that can be toned by hula hooping include: glutes, thighs, hips, legs, knees and abdomen. In addition, you can twirl a hula hoop with your arms to tone your shoulders and forearms. Hula hooping with heavier hoops can provide additional resistance to tone these muscles faster. Hula hooping is such a low impact exercise that just about anyone can use it to increase their endurance and general fitness level. Even just 10 minutes of hula hooping can provide enough benefit to your body to increase aerobic activity. Hula hooping is so effective as an aerobic workout that an hour of hula hooping can help you burn just as many calories as the same length of time of an intense workout, such as the treadmill. For those unable to perform serious aerobic exercises due to health reasons, hula hooping can be their gateway to better health. Hula hooping is fun, and it makes exercising less of a chore. To be able to do something fun and see the improvements to your body can liven your spirit and raise your confidence. Hula hooping requires a certain timing and rhythm. By practicing, your coordination will improve as your body starts to learn this timing. As your skills get better, hula hooping with more than one hoop at once can be challenging and help to improve your coordination even further. The motions of hula hooping require a significant range of motion for your spine. Increased practice in hula hooping can train your spine to a greater range of motions than you’re used to, thereby increasing your flexibility. This can help you in the prevention of back injuries. These are just a few of the benefits that hula hooping can provide. 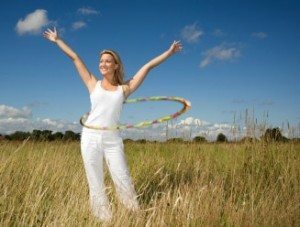 While hula hoops may seem like child’s toys, they can be an effective weight loss tool for adults as well. While the plastic models available for children will not offer much for an adult, you can purchase weighted hula hoops to effectively workout. Hula hooping may be one of the easiest and most fun methods of weight loss that you can find.